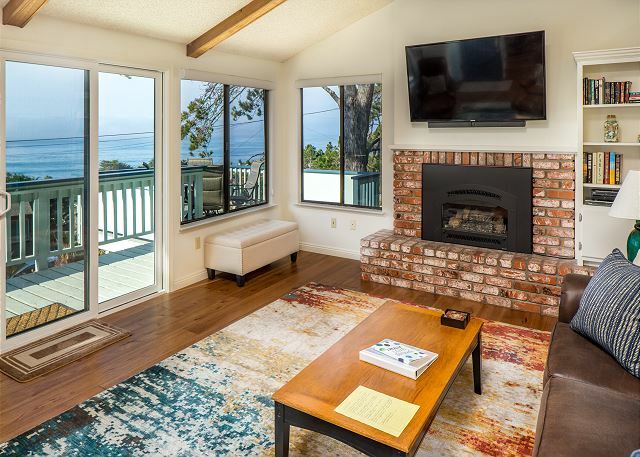 Sea Breeze - Ocean Views Galore! Upper driveway- No stairs to kitchen! Your choice - coffee or wine? Panoramic Park Hill ocean views! Two Master suites with king beds. Newly remodeled open floor plan. All new appliances. Gas fireplace, hardwood floors, washer/dryer, 55” Smart TV with Blu-ray, Wi-Fi, private brick patio with BBQ. Two bicycles. Electric vehicles: 240 Volt NEMA 14-30R 30 Amp in-garage charging receptacle. Bring your adapter and cord. Take a five-minute walk to Shamel Park and the beach. Catch the sunset on the two Ocean-View decks. Cozy up to the fire pit.. Fall asleep to the sound of crashing waves. This home allows four-night stays during the high season! A perfect romantic get-a-way for 1 or 2 couples! Complete gourmet remodel in 2018. Reverse Osmosis filtered water at sink. Mr. Coffee and Keurig coffee makers. (Bring your favorite pods!) Grinder supplied. Large capacity, very quiet dishwasher. Skylight for great natural light. Fully equipped, service for 16. Turkey roaster, chicken roaster, cookie sheets, muffin tin, griddle, stainless steel and non-stick cookware, 9x13 casserole dish, loaf pan, pizza pan, popcorn maker, blender, hand mixer, storage containers with lids, baggie assortment, plastic wrap and foil. Walk-in pantry. Picnic supplies. Some spices, oil and vinegar. Place mats and cloth napkins. Look for hors d’oeuvres plates in the buffet. Weber gas barbeque with bistro table and chairs. Spectrum TV Silver package. HBO, Cinemax, Showtime, Disney, ESPN, History and more. Three Blu-ray players and DVD library for adults and children. Free access to Netflix. Electric vehicles: 240 Voit NEMA 14-30R 30 Amp in-garage charging receptacle. Bring your adapter and cord. 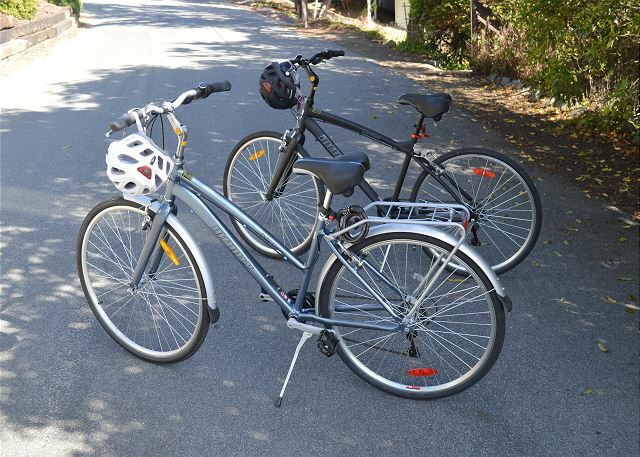 Two 7-speed bikes with helmets. Combination lock and foot pump. Easy rides to breakfast in town, Moonstone Beach Drive, and through Fiscalini Ranch Preserve. Beach chairs, beach towels, and sand toys. Igloo coolers, totes, and beach blanket. Had a great time. Everything was well appointed and we wanted for nothing. Look forward to staying there the next time we are in town. Loved the mattresses wish I knew where they were bought. Fabulous nights sleep. We had an awesome time in Cambria. The house that we rented was fabulous! It had everything we needed for an enjoyable stay. The ocean view each night was spectacular! Thank you for your kind review. We're so happy you enjoyed your visit and hope to host you again in the future. We take a trip with our friends from Cleveland every year. We wanted to explore the Central Coast, go wine tasting, travel the area, etc., and this house was the perfect spot to base our fun from. The setup with two master suites is perfect, and the kitchen was amazing! We enjoyed preparing meals, and it was a great space to hang out, have snacks and drink wine. Waking up to the ocean view every morning was perfect, and the sound of the waves crashing could be heard quietly all the time, which made it even more relaxing. We truly enjoyed out time there and would not hesitate to recommend it, or rent it again. We were very pleased with this rental home. It had all the amenities & comforts needed to fulfill our 4-night stay wishes. The kitchen & dining facilites were just right for tow couples. Living room space was comfortable, making the evenings very nice. The two bedrooms were matched and gave each couple equal comfort. The owners did great job on renovation. Clearly future improvements will make the home even better. We were very pleased with our three-night stay at Sea Breeze. We met our son and his friend for his 30th birthday celebration. The house was spacious, had very comfortable furniture, provided lovely views, provided several outdoor seating areas, and was within walking distance of the ranch preserve. The kitchen was incredibly well-stocked. Finally,the location was ideal for both sightseeing and dining. 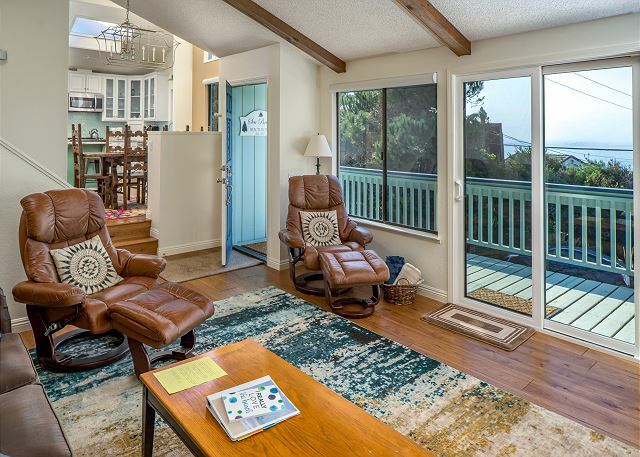 Sea Breeze is one of the best homes I have rented in Cambria. It is well-equipped and the owners have everything organized, including how to deal with all the remotes (Whew!). The new kitchen is wonderful, the view is great and the two master suites are perfect. We will definitely stay here again. My husband and I with another couple stayed here 3 nights and not one of us wanted to leave. It is a beautiful home. The kitchen is amazing as well as the ocean view. We stayed at another rental in Cambria a few years back that boasted an ocean view (with pictures) that was not accurate. The pictures you see are exactly what you get. We went to Moonstone Beach and did some beachcombing and went gift shopping in town at "Best Kept Secret". It is a fabulous store, reasonably priced and has something for everyone. We decided to go into Paso Robles and do some wine tasting and antiquing, however it is not necessary to leave this quaint lovely town. There is plenty to do right here. We want to make this a yearly trip with our friends and will stay HERE again. However, we must stay longer. I almost forgot, the firepit was great, we poured a glass of wine and watched the ocean waves . There is also a walking path thru the nature preserve down the street that we enjoyed. I wish I could attach our pictures. I cannot say enough about how much we enjoyed this property. This was the nicest property I've ever rented. Perfectly stocked and maintained. Perfect house for two couples to rent. Wish we could have stayed longer! Nice view, great kitchen and living room and decks. We had a wonderful time in Cambria and definitely chose the right home Sea Breeze for our stay. It was convenient to town and the beach. The ocean views were great. The house is lovely with everything we needed. We were amazed and happy that the area was so quiet. We wish we had more time but we will be back. The property management staff were excellent. This place is a great value for those who don't need to be right on the water, or a second rental for large families that might need more room. The house is setup well for two couples (since it has two masters with bath and king sized beds), or for a young family if the kids can share one of the king sized beds. White water views from every room except one of the masters, and because the house is on the hill facing the ocean, you can hear it well too. Everything is clean and/or new condition; such as two adult-sized bikes/helmets in the garage, plus beach towels/chairs etc. For those with an electric car, there is a NEMA 10-30 plug in the garage. We didn't use it and I I don't know if the owner's will allow it, but I would have drove our Tesla, and brought our charging adapter if I had known, and gotten approval. The NEMA 10-30 is the old style electric cloths dryer outlet. This home was the perfect relaxing escape from the triple digit heat in Fresno! 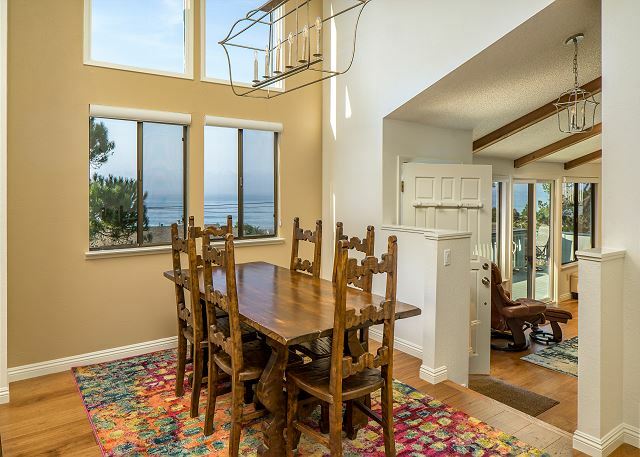 Our favorite part about the house was the beautiful view of the ocean! The updated kitchen is gorgeous, and the home is well stocked with everything you need. There are also many beach amenities available to use such as beach towels, tote, chairs, and sand toys for the kids. The instructions were very helpful, the barbecue was easy to use, the bench outside was very comfortable, and the fire table was amazing (we used it every night). It's also in a great location, close to Moonstone Beach, Fiscalini Ranch Reserve, and downtown Cambria, just to name a few of our favorites. Our family loved every minute of our stay and can’t wait to come back! Thank you for sharing the Sea Breeze with us! The house was lovely.... beautiful views, extremely comfortable and clean, had everything we wanted and more. We love Cambria, and Sea Breeze was the perfect place for us. Can’t wait to return! We had a wonderful experience at the Sea Breeze property! The house was well stocked with everything you need for meal prep and trips to the beach. 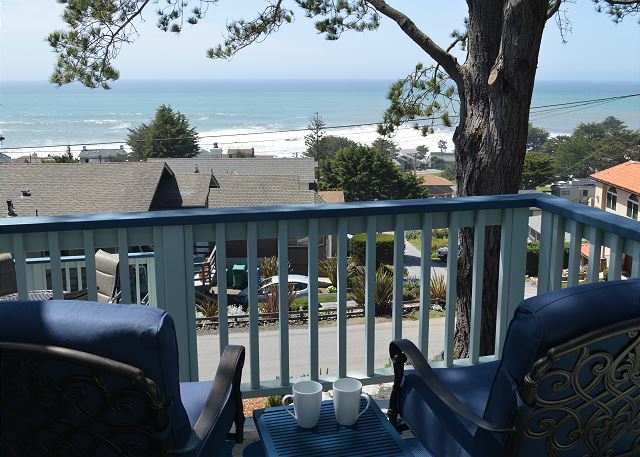 The ocean views from the deck were great and being able to open the windows and hear the waves crashing was awesome. Also, the fire pit was a great amenity that we used every evening and absolutely loved. I highly recommend this property and will definitely be back again in the future. This house was beautiful. 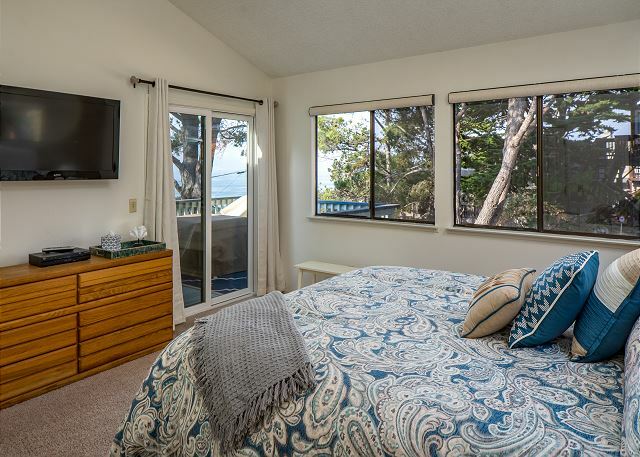 There is an ocean view from almost every room. The kitchen was modern and had all the equipment you could possibly need. At night you could hear the waves crashing. 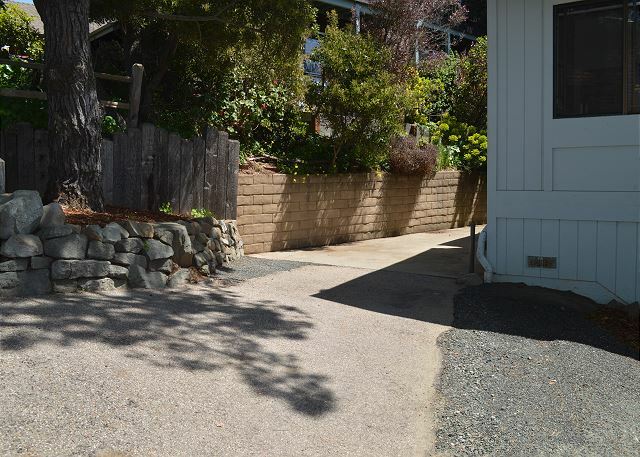 Easy walking distance to the Fiscalini Ranch, Moonstone or town. Perfect size for 2 couples. The perfect house for two couples. Cambria is our special town for a short escape. First time renting Sea Breeze and we were so pleased we did. The house was clean, beds very comfortable and Kitchen had everything we needed. One of the best rental houses we have stayed in. Thank You to the owners for thinking of everything for our comfort.